Daniel Chan (陳曉東) has finally settled down. The 38-year-old held a private wedding banquet in Hong Kong on February 12 to celebrate his marriage to girlfriend, 26-year-old Wang Yuxian (王妤嫻). Daniel also confirmed earlier reports that his girlfriend is pregnant, though insisted that it was simply a happy coincidence. After his very public break up with Cecilia Cheung (張栢芝) more than a decade ago, Daniel has dated several rising starlets but none of these relationships lasted. Working mostly in Mainland and Taiwan in recent years, he gave his heart to Mainland actress Pei Wei Ying (裴唯瑩) in 2006 but the pair split shortly after. He later dated model Dan Dan (丹丹) and the two had plans to marry in 2010 but fate was not on their side. He was then rumored with Taiwanese model Mandy Wei (魏蔓), though that romance also did not last. In early 2013, he participated in the filming of Taiwanese idol drama Love SOS <愛情急整室>, playing the director of a cosmetic surgery clinic. While on location, he met local nurse Wang Yu Xian and quickly developed romantic sparks. At the end of January 2014, local media began reporting on a possible wedding, and some said that Yuxian was two months pregnant. Earlier this week, the couple brought their families on a Dubai trip during Lunar New Year to discuss wedding details. Although the couple wished to keep their banquet private, the press showed up outside of the venue. Dressed entirely in gold, the bashful bride faced the press for the very first time as Daniel discussed their big day in Cantonese. He explained that they have yet to register for their marriage, though there are plans to hold multiple celebrations in Hong Kong, Taiwan, and China to celebrate with all of their friends and families. When confronted about the pregnancy rumors, Daniel admits that Yuxian is currently four months pregnant but clarified that it was not the reason behind their quick marriage. “We already had plans to get married. When I began to discuss the matter with her, she said, ‘I think I may be pregnant. '” Although still too early to tell, the doctor has predicted that they are likely expecting a girl. Daniel is happy regardless of the gender of the baby and is already thinking about having more. On AEU, wife is 24 years old and here they have it as 26. on well, Daniel Chan looks cute still even at 38. WOW!! Looks even younger than Nicholas Tse and I think NT should be younger? I disagree. He looks older than 38. I was thinking early 40s and while Nicholas Tse is younger, he definitely looks younger than Chan. He does look old in the above photo,but not sure if that is how he always looks. Yea, I think he looks quite old in the photo above as well. Around mid forties. At first I was like who is 陳曉東? But after googling and found his old pictures… dang. Aging got him good. he’s so good looking. he looks like the combination of Show Luo and Aaron Kwok. This guy used to be one of the most popular singer/actor in Hong Kong. What happened to him? He is still acting and singing. He was in Lan ling wang( I think that is title of that series) witty Ariel Lin. Yes he is in Lan Ling Wang with Ariel Lin. Yeah, but he was up at the top in the late 90s, and seems to have hit rock bottom for a number of years now. Well no one can be at the top forever. There are ups and downs to everything. 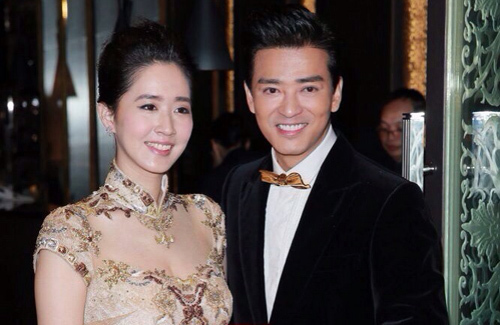 His wife looks like carol chu, Andy lau’s wife. wow…he aged really bad for a celebrity. Wang Yu Xian looks nothing like Carol Chu, I beg to differ. Wow, she is too young for him!! !, lol. He is too old for her!! !, lol. Nooooooo!!!. She needs to marry a man who is only 1 or 2 years older, no more than that, not even three years older. That sort of thing should not be allowed. He should be jailed for robbing the cradle!!!!. LOL. In all seriousness, I wish the newly married couple all the best in their married life and also in their professional lives. practically all the latest celeb couplings involve age differences of over 10 years. Hope to see his wife starring in a drama. she already has a career as a nurse. he only 12yrs old no biggy! He does look good for his age. He use to be real cute n hadnsome. My teenage years idol! Wish him & bride happiness, congrats! Congrats to Daniel and his new wife! Wish them a lifetime of love and happiness! They have double happiness!! I really forgot his existence! Still acting? Yes, as I have mentioned above, he was in that one series with Ariel Lin. He sang one of the songs for the soundtrack too. He does, but mostly idol drama I would say. The recent Prince of Lanling? He plays Yu Wen Yong.. I could not recognize him and had to google. Congratulation to the couples. Meant to say that I always thought he was gay.